The paddle leash is used to keep from losing your paddle during high winds and rough seas. By attaching your paddle to your wrist or your kayak with a paddle leash, the paddle will remain with you even if you happen to drop it into the water. During high winds, rough seas and fast currents, a paddle dropped into the water will float away faster than you will be able to reach it. If you happen to be paddling alone and you don't have a spare paddle, you will be in deep trouble. Your paddle leash protects you from this dangerous situation. If kayak photography is added, in which you voluntarily let go of your paddle, it creates the possibility for the loss of your paddle. There are two types of paddle leashes: the store-bought and the homemade. The store-bought paddle leash will either have a coiled bungee cord (shown above) or a straight 1/4" bungee cord (shown to the right). On one side of the leash is a velcro band that wraps around the paddle shaft. The other side of the paddle leash either has a velcro band or a clip. The clip attaches to the deck line while the velcro can either attach to the deck line or your wrist. The paddle leash usually comes in two lengths: short and long. The short paddle leash is not long enough for advanced paddle strokes. Make sure you can do all your strokes with the paddle leash on, especially the extended position. The coiled paddle leash will seem shorter as it only coils out to the longest length when you extend your paddle. With the forward paddling stroke, it will stay somewhat short. 1) You don't have to make the leash. 2) The leash protects your paddle from floating away. 1) The leash is usually too long and gets in the way, even the coiled leash. 2) The leash that attaches to your wrist is hard to take off fast in an emergency situation. 3) The leash that attaches to your deck line could wrap around your neck or other parts of your body if you happen to flip your kayak. 4) There is no good place to attach the leash to your deck line. 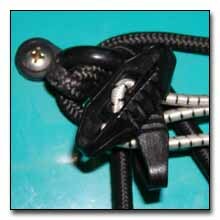 5) The bungee cord is 1/4" wide. Two different styles of paddle leashes can be made. They are both made from 1/8" bungee and perform exactly the same. Both sides of the paddle leash have a loop and either has a plastic ball or a toggle (shown in the photograph on the right). Both paddle leases are used exactly the same. 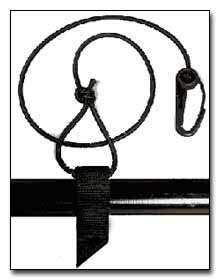 One side of the paddle leash is attached to the paddle shaft and the other side is either attached to your wrist or attached to the deck line. Since both sides are the same, you never have to decide which side attaches to the paddle and which side attaches to the deck or to you. When you are attaching the paddle leash to the deck, all you have to do is slide the plastic ball (toggle) underneath the deck line. The pressure of the deck line and the size of the ball (toggle) will keep the leash securely attached to the boat even though it is not tied or clipped in. In case of a dangerous situation (such as the leash being wrapped around your neck), all you have to do is pull the leash hard and the leash will disconnect from the deck. Attaching the paddle leash to the deck line allows you to drop your paddle into the water when you need two hands for photography, etc. 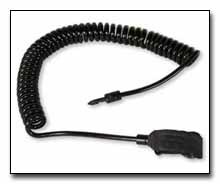 The leash can either be stored in your PFD pocket, wrapped around your paddle shaft or looped around your deck line (shown below). I use the paddle leash shown above and I wrap it around my deck line. The toggles can be squeezed, moved and adjusted to fit anyone's wrist exactly. The advantage of this leash is that it will be with you at all times. A paddle leash, along with other important gear, is sometimes left behind when the sun is shining brightly, there's not a cloud in the sky and the weather forecast predicts a perfect day. When a summer thunderstorm appears out of nowhere, that's when you wish you weren't so lazy and packed the needed gear. 2) The lease will be with you at all times. 3) Less chance of tangling or choking you. 4) Fast release and setup. 6) The bungee cord is 1/8" wide. 7) A spare leash can be carried since it is so small. 1) You have to assemble the leash.